Operating across multiple countries in ASEAN and South Asia with approximately 12,000 employees, Axiata serves millions of customers through our operating companies, offering mobile network, communications infrastructure and digital services. Axiata Digital’s mission remains to enhance Axiata’s core business revenue by creating new sources of value and contributing to the longterm upside creation through partnerships and acquisitions in the digital ecosystem. Through Axiata Digital, we have expanded our portfolio of services to cater to online customers via connected devices and our digital strategy has managed to capture an increased share of customer wallet and reach beyond Axiata’s traditional mobile services of approximately 320 million mobile subscribers. Axiata Digital is in a unique position to leverage on the Group’s strength as a leading regional telecommunications operator, by building on existing customer relationships within our eight mobile markets, which now includes Nepal through the acquisition of Ncell in 2016. It is also able to capitalise on the physical distribution networks of Axiata and partner stores in most of our markets of operation, allowing customers and digital businesses alike to have physical points of contact. The learnings, experience and data acquired from incubating and launching new businesses have assisted Axiata Digital in developing new business models to address prevailing market challenges of hypercompetition, disruptive technologies and new trends. 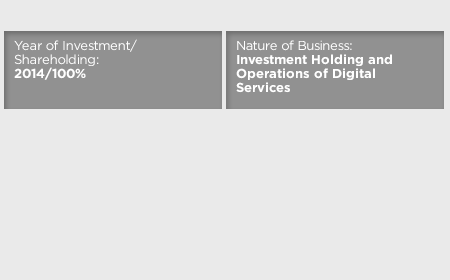 As at end 2016, Axiata Digital has focused its investments in seven key business verticals namely Digital Advertising, Digital Marketplaces, Digital Financial Services, Digital Entertainment and Education, Internet of Things (IoT) and Over- The-Top (OTT) Enablement Platforms. We have 29 digital businesses across these verticals, with three subsidiaries and seven joint ventures, and serve 32 million customers.